A pilot assigned to the 57th Adversary Tactics Group proudly displays their unit patch during a change of command ceremony at Nellis Air Force Base, Nev., Aug. 3, 2018. The 57th ATG is made up of seven squadrons, including three geographically separated units. The 57th Adversary Tactics Group held a change of command ceremony Aug. 3, 2018, at Nellis Air Force Base, Nev.
Col. Travolis Simmons is taking over command from Col. Samantha Weeks, who had been in command for nearly two years. 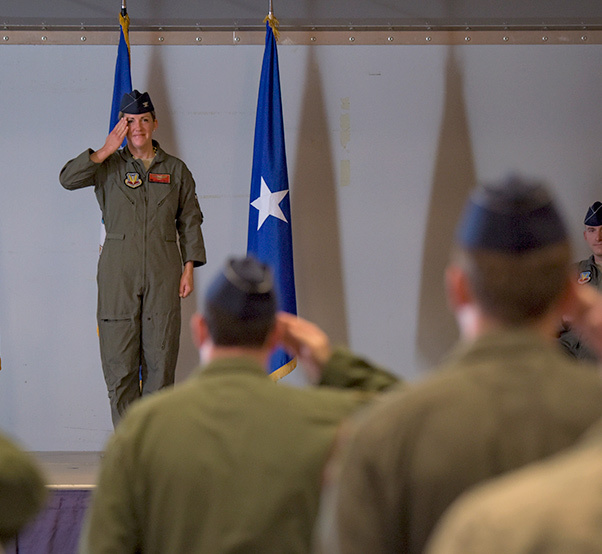 Col. Samantha Weeks, 57th Adversary Tactics Group outgoing commander, renders a final salute during a change of command ceremony at Nellis Air Force Base, Nev., Aug. 3, 2018. Weeks was the 57th ATG commander for nearly two years. Simmons’ previous assignment was with the United Nations Command and United States Forces, Korea. Weeks will head to Columbus Air Force Base, Miss., as the incoming commander of the 14th Fighter Training Wing. The 57th ATG is made up of seven squadrons and three geographically separated units which integrate operations across air, space, cyberspace and land domains. They present a selectively-manned Aggressor force to train and prepare the U.S. and its allies for victory. Brig. 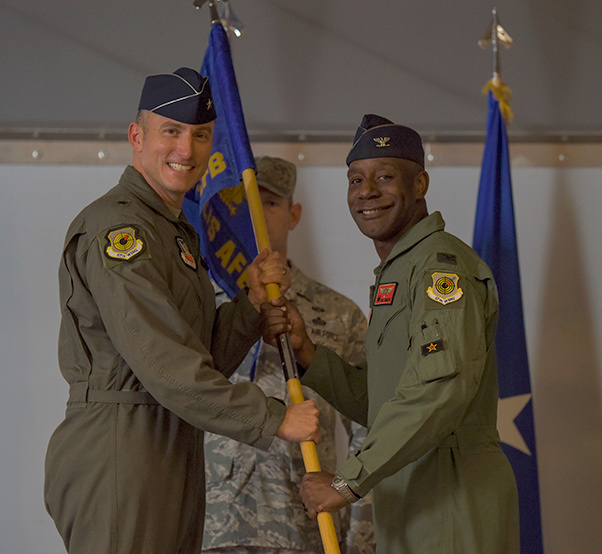 Gen. Robert Novotny, 57th Wing commander, passes the guidon to Col. Travolis Simmons, 57th Adversary Tactics Group incoming commander, during a change of command ceremony at Nellis Air Force Base, Nev., Aug. 3, 2018. 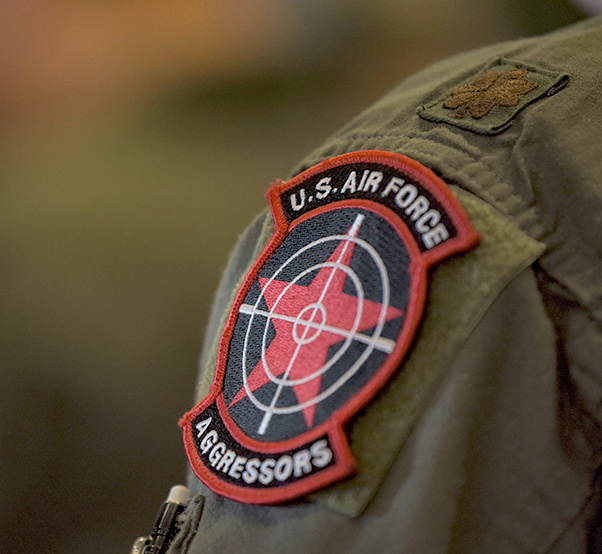 The 57th ATG is made up of seven squadrons, including three geographically separated units. 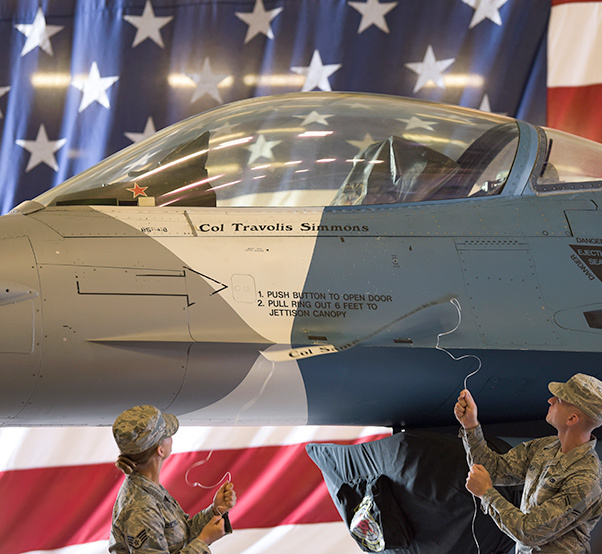 Airmen assigned to the 57th Aircraft Maintenance Squadron Viper Aircraft Maintenance Unit reveal the 57th Adversary Tactics Group incoming commander’s name during a change of command ceremony at Nellis Air Force Base, Nev., Aug. 8, 2018. The 57th ATG boasts the world’s most capable and professional aggressor force to train US personnel and coalition partners during exercises and deployments. 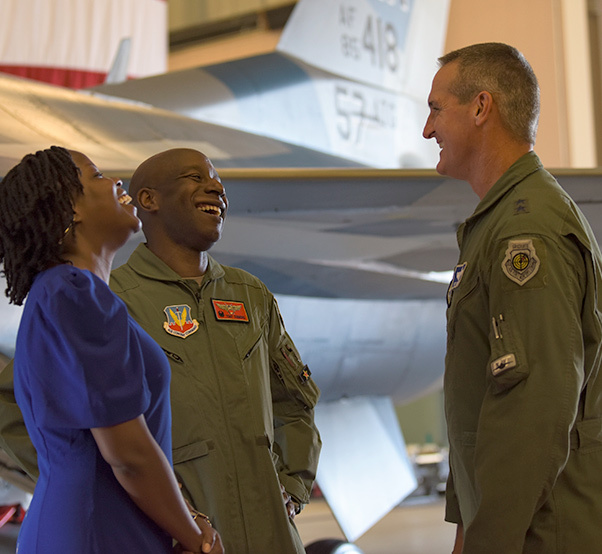 Maj. Gen. Peter Gersten, U.S. Air Force Warfare Center commander, greets Col. Travolis Simmons, 57th Advanced Tactics Group commander, and his wife after a change of command ceremony at Nellis Air Force Base, Nev., Aug. 8, 2018. The 57th ATG prepares the military to win our nation’s war by providing leaders who know, teach and replicate the enemy.